Beniaminus Franklinius vel Anglice Benjamin Franklin et saepissime Ben Franklin (natus Bostoniae, 17 Ianuarii 1706; mortuus Philadelphiae, 17 Aprilis 1790), unus ex Conditoribus Civitatum Foederatarum, fuit scriptor et satirarum scriptor, miles, vir rerum civilium peritus, vir reipublicae peritissimus, rerum novarum cupidus, Pennsilvaniae praeses suffectus, typographus, physicus, inventor. Franklinius fuit sodalis Regalis Societatis Londiniensis (anno 1756 cooptatus) conditorque Societatis Philosophicae Americanae. Etiam Declarationem Libertatis Civitatum Foederatarum Americae et abolisionista fuit. Bostoniae sita est ipsius statua in cuius base sunt verba Eripuit caelo fulmen sceptrumque tyrannis, versus Manilii (Astronomica 1.104). ↑ Nomen inscribitur Benjaminus Franklinius in Francis Glass, A Life of George Washington, in Latin Prose, ed. J. N. Reynolds (Novi Eboraci: Harper & Brothers, 1835), p. 125. Ketcham, Radulphus. 1966. Benjamin Franklin. Editio interretialis. Lemay, J. A. Leo. The Life of Benjamin Franklin. Asimov, Isaac. The Kite That Won The Revolution. Fleming, Candace. 2003. Ben Franklin's Almanac: Being a True Account of the Good Gentleman's Life. Atheneum/Anne Schwart. ISBN 978-0-689-83549-0. Anderson, Douglas. 1997. The Radical Enlightenments of Benjamin Franklin. Buxbaum, M. H., ed. 1987. Critical Essays on Benjamin Franklin. Chaplin, Joyce. 2007. The First Scientific American: Benjamin Franklin and the Pursuit of Genius. Cohen, I. Bernard. 1990. Benjamin Franklin's Science. Conner, Paul W. 1965. Poor Richard's Politicks. Dull, Jonathan. 1985. A Diplomatic History of the American Revolution. Dray, Philip. 2005. Stealing God's Thunder: Benjamin Franklin's Lightning Rod and the Invention of America. Ford, Paul Leicester. 1899. The Many-Sided Franklin. Editio interretialis. "Franklin as Scientist" in The Century (Sept 1899) v.57 pp. 750–63. "Franklin as Politician and Diplomatist" in The Century (October 1899) v. 57 pp. 881–899. Gleason, Philip. 2000. "Trouble in the Colonial Melting Pot." Journal of American Ethnic History 20(1):3–17. ISSN 02785927. Houston, Alan. 2009. Benjamin Franklin and the Politics of Improvement. Lemay, J. A. Leo, ed. 1993. Reappraising Benjamin Franklin: A Bicentennial Perspective. Olson, Lester C. 2004. Benjamin Franklin's Vision of American Community: A Study in Rhetorical Iconology. Newman, Simon P. 2009. "Benjamin Franklin and the Leather-Apron Men: The Politics of Class in Eighteenth-Century Philadelphia." Journal of American Studies. 43(2):161–175. Schiff, Stacy. 2005. A Great Improvisation: Franklin, France, and the Birth of America. Schiffer, Michael Brian. 2003. Draw the Lightning Down: Benjamin Franklin and Electrical Technology in the Age of Enlightenment. Skemp, Sheila L. 1994. 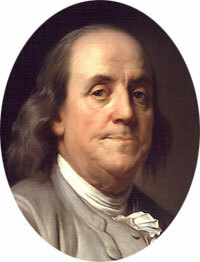 Benjamin and William Franklin: Father and Son, Patriot and Loyalist. Sletcher, Michael. 2006. "Domesticity: The Human Side of Benjamin Franklin." Magazine of History 21. Waldstreicher, David. 2004. Runaway America: Benjamin Franklin, Slavery, and the American Revolution. Hill and Wang. Walters, Kerry S. 1999. Benjamin Franklin and His Gods. York, Neil. 2009. "When Words Fail: William Pitt, Benjamin Franklin and the Imperial Crisis of 1766." Parliamentary History 28(3):341–374. Novissima mutatio die 13 Aprilis 2017 hora 16:57 facta.